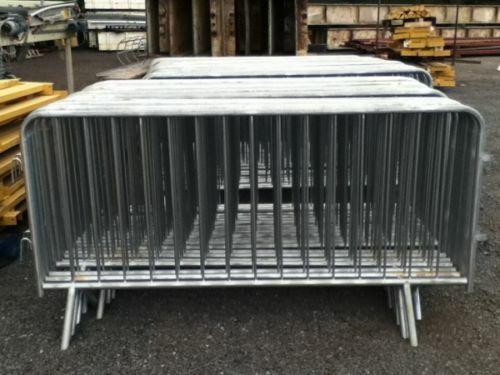 Crowd barrier 2.3m galvanised fixed legs. All barriers are manufactured with a formed tubular frame and offer a welded mesh and solid bar infill. As standard all barrier systems are hot-dip galvanised for durability, or as an addition a powder coating option can be supplied to match a corporate image. Pedestrian barriers are most commonly seen at outdoor events where the safe direction of pedestrian traffic is required, however they can also be seen on construction sites and road works.